Demos, the UK think tank “for everyday democracy”, has published a new report on “self-directed public services”, entitled “Making It Personal“. his report advocates a simple yet transformational approach to public services – self-directed services – which allocate people budgets so they can shape, with the advice of professionals and peers, the support they need. This participative approach delivers personalised, lasting solutions to people’s needs at lower cost than traditional, inflexible and top-down approaches, by mobilising the intelligence of thousands of service users to devise better solutions. The self-directed services revolution, which began in social care with young disabled adults designing and commissioning their own packages of support, could transform public services used by millions of people, with budgets worth tens of billions of pounds. From older people to ex-offenders, maternity to youth services, mental health to long-term health conditions, self-directed services enable people to create solutions that work for them and as a result deliver better value for money for the taxpayer. Self-directed services can be taken to scale safely while minimising fraud and risk. They can also be good for equity because they empower those people who are the least confident and able to get what they want from the current system. Self-directed services give people a real voice in shaping the service they want and the money to back it up. Previous approaches to public service reform have reorganised and rationalised public services. Self-directed services transform them. Charles Leadbeater is a Demos Associate, author of We-Think, a visiting fellow at NESTA, the National Endowment for Science Technology and the Arts, and a partner in the new start-up Participle (the other partners are Hilary Cottam and Colin Burns). The two other authors, Jamie Bartlett and Niamh Gallagher, are researchers at Demos. 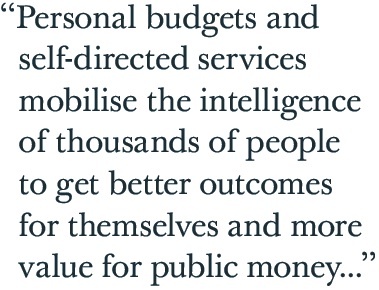 Self-directed service turns traditional public services on their head. In social care, for example, if someone is eligible for local authority funding, social workers devise a care plan that allocates the individual to services that are paid for and are commissioned by the local authority. It is rare for the individual to have much of a say in how services are designed, but self-directed services put the person at the centre of the action. Professionals help an individual assess their eligibility, and the person is then given an approximate budget so they can design services that make sense for them. Once the plan is approved by the authority, the money flows to the individual and on to the service providers of their choice.